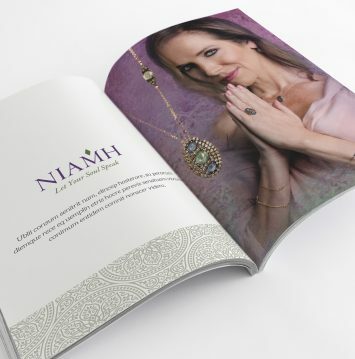 Niamh jewellery brand is one that is designed to a very specific target audience of women who buy expensive jewellery and practice yoga, with an interest in crystals. The jewellery is designed mostly with black diamonds and sapphires. CUBE Design took a fashion style approach to this project, as the woman they were targeting was very specific. 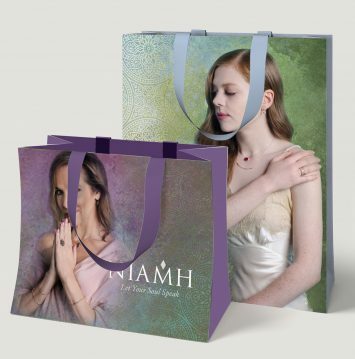 The logo is a very simple serif and elegant font with the diamond shape referring to the old Irish way of spelling Niamh, but keeping the 'h' in the name for ease of pronunciation. The shape refers to the diamonds which are used heavily in the jewellery designs. 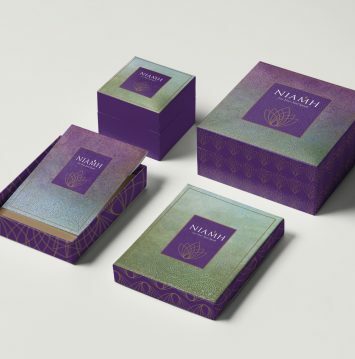 Along with, painted textures, patterns and a selection of images which we art directed on a photoshoot, we created a flexible brand that was very distinctive.